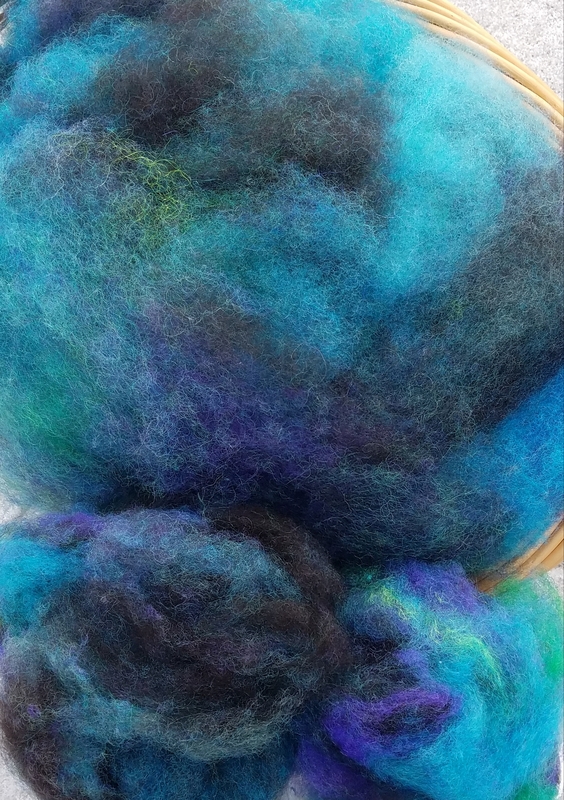 Blue springs cloud spins into a beautiful woolen yarn full of texture and color depth. 4 ounces of carded wool blend for hand spinning or felting. This long wool blend with silk noil and firestar will spin together easily and the yarn or felt, will be durable with loft and sheen. The firestar and silk noil is added for contrast. Colors include: emerald greens, turquoise, dark blues, with a hint of warm color tones & glitz accenting the mostly blue/green base. Spinners accustomed to commercial combed top, which can be dense and require significant predrafting, will likely find this carded preparation easy to spin. Opalescence carded wool blends are made by feeding washed wool (and other fibers) into a carding mill that opens up the locks, removes vegetable matter and passes it through several carding rollers that card the fibers but do not align the fibers parallel as in combed top. The wool you spin directly from this cloud will make a beautiful woolen yarn, the same as is spun from wool roving. The animals whose fibers are in this blend were raised by shepherd's dedicated to the fiber arts and to their fiber animals. At Dakota Carding & Wool we pasture raise our sheep and maintain a non medicated, healthy environment for our four-legged friends! All of the fibers have been carefully sheared, washed, dyed and carded using ecologically safe soaps and dyes. Biotayarns is always designing new color blends so please follow us on facebook for more colorful updates!